If there is one thing I LOVE it’s a great solution for a common problem! I was recently contacted by a brand new company called Dipsy Dabber about reviewing their product and I am SO happy to introduce you to it! 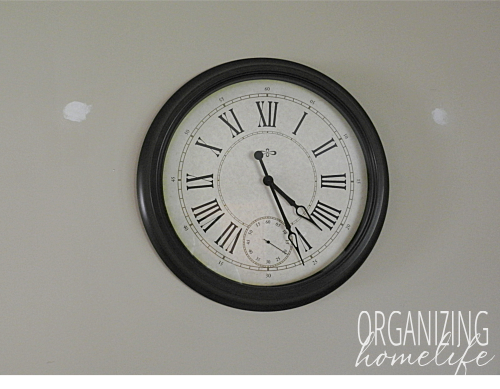 If your house is anything like mine, you’ll know what I’m talking about when I say that it is such a pain to touch up scuffed walls or repair picture holes when you want to change your wall art. With four kids, it seems like there is always a chip or scuff that just needs a dab of paint to touch up. Call me lazy, but I do not like pulling out the paint stirrer, paintbrush, and lugging the gallon of paint into the house for a little touch up, not to mention the clean up after I’m done. I love color on my walls and think it makes our home beautiful, but one downside to having different colors on our walls is the number of paint cans we need to store. 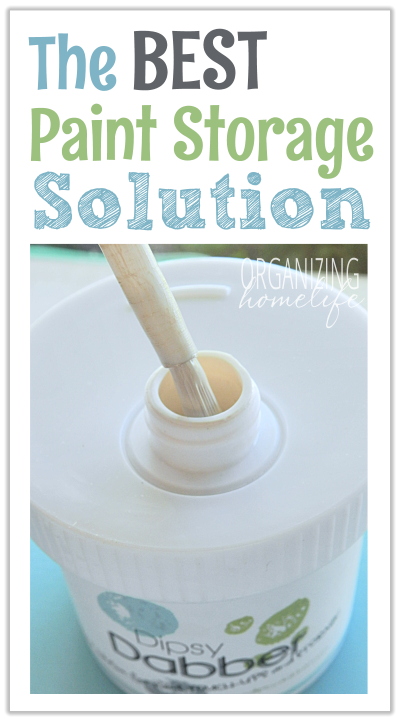 I’ve seen creative solutions all over Pinterest for keeping paint in smaller containers like mason jars, but I seriously would hate to accidentally drop that jar! I was ecstatic when I received the Dipsy Dabber. These folks came up with a GREAT solution! 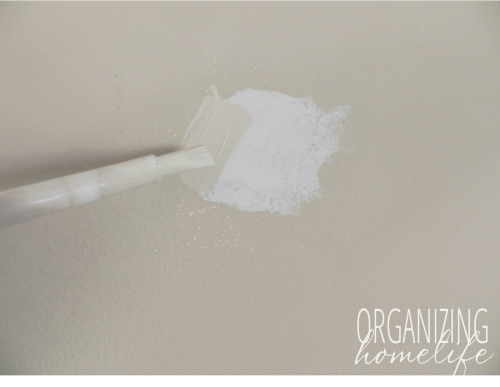 They created a thick plastic, airtight container with a screw on lid that has a mini brush included, eliminating the need for washing your paintbrush and stirrer after touching up your walls! Woohoo! Simply shake the jar to mix, unscrew the paint brush, touch up your wall, screw the paint brush right back into the lid, and put it back on the shelf! Simple! The brush tucks right into a rubber valve to keep the paint from drying out and prevents too much paint from coming out with the brush. So what did I test it on? I’ve had a large picture with brass sconces in my living room for years. I know the “gold look” is coming back, but I’ve been over the look of this wall for a while! I cannot even begin to tell you how WONDERFUL the Dipsy Dabber is! It was a cinch to touch up the paint! It reminds me of a large nail polish brush. 🙂 The paint goes on smoothly and because of the valve in the lid, I never felt like there was too much paint that could drip – it held just the right amount. Here’s the touch up with the paint still wet. And here’s the lonely clock on the wall with not a trace of what used to be there! The folks at Dipsy Dabber really put a lot of thought into this product. 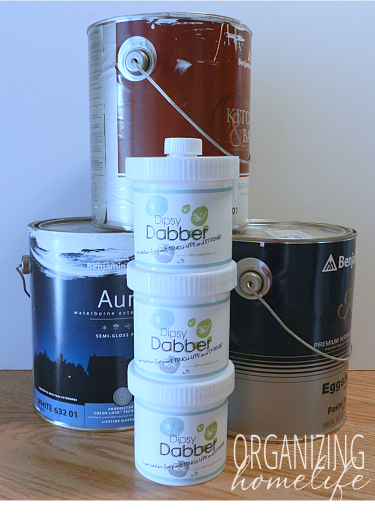 There is a spot on the label to dab your paint color as well as mark the details such as: paint name, brand, sheen, code, and room painted. Plus, they recessed the base so they can stack neatly despite the brush cap being raised on the lid. Genius! Now instead of having lots of gallon sized paint cans with only a little paint in each one, I can neatly store my paints and easily use them for touch ups when needed! Why do I love the Dipsy Dabber? It eliminates the need for storing large paint cans. The screw on cap allows for easy filling (or if for some reason you do have a larger area to paint with a brush, simply take the lid off and use a regular sized paint brush). The valve in the lid prevents too much paint from coming out on the brush. The thick plastic container prevents discoloration from light. No need to stir – simply shake the container. No need to wash a paint brush – YAY! Dipsy Dabbers can be stored on a closet shelf right in the room itself, or, stacked neatly with other Dipsy Dabbers. I am thrilled to tell you about these and hope you enjoy using them as much as I do! At just $5.99, they are super affordable and would make a GREAT stocking stuffer! Plus, if you order 3 or more, the shipping is free. You can’t beat that deal! Check it out on DipsyDabber.com here. How would you like to win a set of 3 Dipsy Dabbers? I have great news! 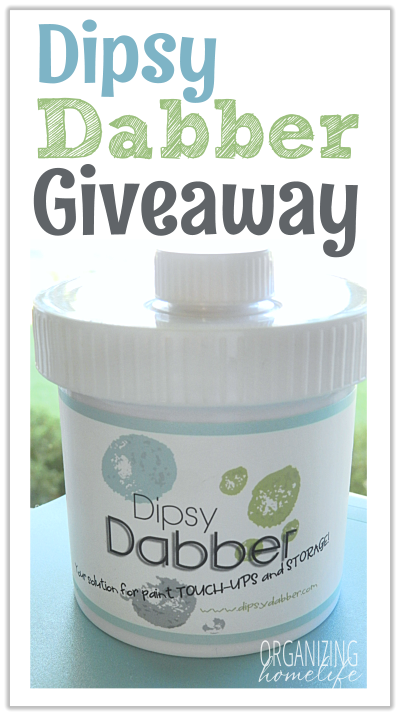 The folks at Dipsy Dabber are generously giving away a set of 3 Dipsy Dabbers to TEN of YOU! Simple! At the end of the post, either use your Facebook or your email to log into the Rafflecopter entry form. Entries are explained in the Rafflecopter form. Ten winners will be chosen randomly using Rafflecopter.com to receive a Dipsy Dabber 3 pack. Giveaway begins Friday, November 15, 2013 and ends at 11:59 p.m. eastern time Sunday, November 24, 2013. Winners will be e-mailed and announced here on Monday, November 25, 2013. Winners have 7 days to respond to e-mail or new winners will be chosen. Disclaimer: I have been compensated by Dipsy Dabber and given Dipsy Dabbers to review, but was not asked to write a positive review. I only share products that I truly love with my readers. If I don’t like it, I won’t post about it and certainly won’t tell you to buy it! See my full disclosure policy here. I love this! So handy and I love the way they stack. Love these, I have tons of paint and these would be great for storing and getting rid of all the big cans I have. I definitely need to touch up my kitchen walls. I love that they are so compact and also that they make it easy to track all the info. We recently moved and are slowly repainting our new home. Lots of new paint colors to wrangle … and constantly touch up! This looks like a time saver! I would LOVE to try this new product! My husband has until Feb 5th to find a new job so now I am all of a sudden in a frenzy getting our home ready to sell just in case we have to move! This would save us money and time and not having to repaint all of the rooms! These are awesome!! I have different colors all over the house, as well as 4 bio kids, 2 bonus (foster) kids, 2 dogs and 2 cats, I NEED these! Love how easy it looks to use and the stackable nature! Love it! Would make it so much easier to do touch ups! I love that they are easy to use. I would love to do some touching up, but my husband puts the cans away where I can’t get at them and then I have a hard time getting them open and pouring, etc. This would be so easy for me!!! This thingy is cool! I would use them in a heartbeat! Wow! What a great idea. That would be great to have at our house since three children playing reeks havoc on the walls. I love that they are small and stack easily, making storage so much simpler. I love that it already has a built in brush that keeps just the right amount of paint. I also love that these would be great for teaching my kids how touch-up when they scuff up! The first thing I’d touch up would be the wall in the kids’ (and guest) bathroom. Then I’d move on to my son’s room, and then I’d touch up my baseboards. I’m remodeling the kitchen, so need for touch-ups there! So wish I’d had these before I moved! We had a LOT of touch-up painting to do, and it was such a pain!! Will definitely be touching up all the little scrapes on the wall! I love that it takes up a lot less spaces than the big gallon buckets too, AND that it’s stackable! I love that they are small and stack so I can keep them in the hall closet without being noticeable. The hallway is the first place I’ll be touching up. What a neat idea! We are finishing our house as we have the money (very slowly). With four children, the first rooms I finished are already needing touch ups. I love this! My living room would be first. Love the no mess no fuss! 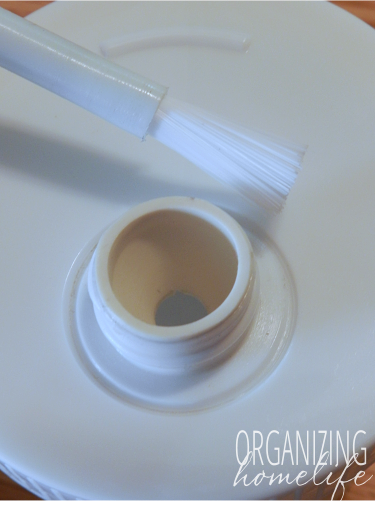 Great product to keep us organized and make touch ups a breeze! I just painted our mudroom and would love to have these for when someone inevitably bangs into the freshly-painted walls! I like the convenience of it. Especially since I have two kids under three. It would make these kinds of tasks much simpler. First thing I would touch up as a room that we converted from the nursery to a guest room. Great idea to free up space in garage from all the large paint cans. I just finished painting the inside of my house. This would be so much more convenient than trying to open the tops of the paint cans with a screwdriver! I would love to have this product! What a clutter saver too ! I sure could use those! What a terrific idea. I won’t have to keep an extra can of paint around or wash another paint brush after touch-ups! I really like the idea, I could certainly use this. I have a little Picasso in my family who likes to leave her signature here and there plus through my whole house the walls have different colors. Would love this… would make my life easier. I would love to have one of these. What an awesome way to store paint and use it occasionally without creating a mess. I will definitely touch up my living room walls immediately. Wow – this is a great product! You can tell they put a lot of thought into it! Okay where has this been my whole life?? LOVE LOVE LOVE it! I haven’t touched up some paint in my hallway for the exact reason of bringing up a whole paint gallon and stirring it up! Even if I don’t win, i’m going to purchase some of these! I’m just now starting to think about how to organize my paints in my first house. This would be just perfect! OMW!! I WOULD LOVE THESE! I rehang pictures all the time and these are SO WELL THOUGHT OUT! Thanks for giving us the skinny! Just repainted family room and was fussing over the number of paint cans that I have to store! This is a great solution. I would love this, I’m a very messy painter and believe this would be a big help. I LOVE this! I have been looking for a paint storage solution and was going to use Mason jars, but I like this better! I LOVE these! What a great idea, I could use about 10 of them and that would clear out my whole closet full of paint! What a fantastic idea! I love that they are stackable! I would touch up our brown wall. I waited to touch up our main color walls until I had about 10 areas that needed it so this would be such a lifesaver. Thanks for the opportunity! Great thing for a quick touch-up of the masterpieces the children leave on the wall! I like that it has the brush included. We need to touch up the wall by our stairs. I love this product! The first place I would touch up are some spots in my hallway. I have limited storage space in my home so my favorite thing about this product is the fact that I no longer need to store large paint cans. We have just painted every wall in our house and I’m sure there will be many touch-ups needed. Plus, we’ve got a LOT of ‘a little paint left in the bottom of the can’ and these are so much smarter! What a great solution! These will be added to my paint collection soon. I’ve lived in my current house 7 years and I’ve painted all rooms at least once and some (like my kitchen) 4+ times! The most recent room I’ve painted is my kitchen and family room. Could definitely use these to touch up spots I missed! Awesome product! I love this! Awesome idea! Great idea, makes touchups easy. Wow, I wish I had thought of that! Genius! I LOVE the idea of this product! What a fabulous way to keep the different colors of your home ready for the TOUCH-UPS we all need, (and on a regular basis! )…So convenient…the dreaded job – HAS JUST TURNED INTO A SMALL TASK! What a great idea! I have 2 young kids and have already noticed scuffs on my walls. I have been delaying retouching them because of the hassle (and I know my walls are just going to get more scuffs! ), but this product would make it much simpler to fix these blemishes as we go, rather than “living with it” because I’m too lazy to fix it the old fashioned way. I am a Professional Organizer and will definitely use this with my clients when thinning out paint cans in their garages. Great product! These look awesome. I would be much more likely to touch up than I am now. This looks awesome – much better than the old baby food jar with touch up paint! Would love to try this! Just bought a house. What a great idea. Brilliant! We just repainted several rooms and now have several paint cans in the garage with just a little paint left in them. This product would save us a ton of storage space and make touchups so much quicker and easier! I would definitely use this product! I need to touch up a few walls in our home, and these would come in handy. And they STACK! I love this! 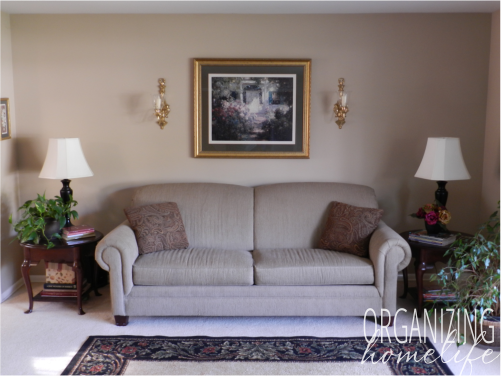 What a great way to get organized–and do touch ups! I always see places I missed AFTER I just put everything away! I have been looking for something like this… I have leftover paint from my quilting room that I created last spring just waiting for a great touch up solution! I’m so excited about these! I’ll be using these to touch up little pen and marker scribbles that happen about once a month. I love that I’ll be able to do it and not have to clean up paint brushes and can get rid of the huge paint cans! This looks amazing! I would love to get rid of the random gallons (and 5 gallon) buckets of paint! I am really excited about this product. 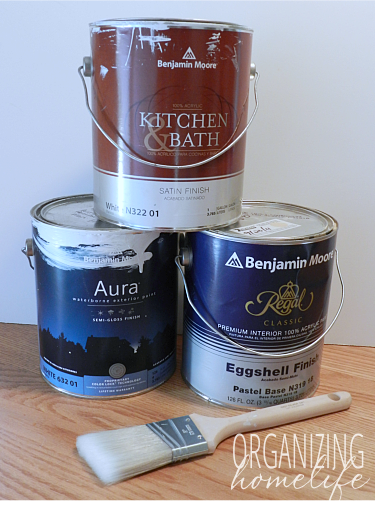 I cannot wait to try it and to recycle the old paint cans in the garage! Thanks for sharing this with us. This makes touching up a wall seem less intimidating! Its chic and seems so much more manageable being in such a small container. I have so many touch ups to do around our home from the kids taping up their artwork on the wall and then enthusiastically ripping them off to show Daddy all while taking the paint with them. And the best, my 3 year old who is an aspiring house cleaner loves to vacuum but his fine motor skills are still developing so banging the corners of the doorways helps him keep the vacuum steady. Now that I think of it, I could really use this!!! I lOVE that they are stackable! Awesome idea! Love the fact that I can get rid of the giant ugly paint cans and be able to touch up so much easier!! I would start with my bathroom! Wonderful idea!!! I can finally get rid of the butter bowls and mason jars of paint. A must have! These would make awesome storage anywhere for paints we need to save for any project, and would certainly be a great solution for those who live in smaller homes with limited storage too! I live in a mobile with very little storage for arts, crafts and paints, so these look like they would be the perfect answer to help me consolidate! Ok this is beyond BRILLIANT!!!! My husband & I were just looking at all those big containers of paint in our garage b/c we needed to touch up a few walls & they’re either half full or less. Such a waste of space…. But these little Dibsy Dabbers are genius! WOW – what an awesome solution to the paint can problem! We just moved into a new house, and plan to do some repainting… having these to store the leftover paint for the “sure-to-come” touch ups would be amazing!! These would make my life so much easier! I keep seeing a few spots I should touch up, but I don’t want to lug out and pry open a gallon of paint. I have some serious spots to touch up in the kitchen! Getting ready to paint our house – this would be terrific to store the touch up paint in! I am planning on touching up some edging and little problems and have been avoiding doing the job since I would have to lug, stir etc. the paint . . . this would be a god-send!!!! What a great idea!!! Absolutely LOVE this!! We’ve been slowly repainting each room in the house and this would be the perfect way to store the extra for touch ups!! The first thing I would touch up would be the downstairs bathroom, since that was the first room that got repainted, and it’s the bathroom for my child care, so it gets more than its fair share of wear and tear! What a perfection solution, I have so many paint cans with just a little paint in them. These are SO clever! I love that the paint wont dry out and they eliminate the need to pull out tons of supplies for touchups. The first thing I’d touch up is our playroom. My kids scratched up some of the wainscoting revealing the previous owners’ terrible orange paint beneath. Terrible! We just finished tiling and painting our laundry room. It needs touch ups from moving the washer and dryer back in. since we are in the middle of remodeling..this is perfect! This is awesome! We are currently in the process of repainting / updating our house. I was trying to think of a clever way to store paint and this is perfect. Wish I already had these as I need to touch up some baseboard moldings! Love that u can keep them in a close place for use and are compact and stackable. Also having the touch up brush attached is just so cool and convenient! These are the coolest idea!! My husband and I are always moving the paint around in the garage to find more space. Love! I got inspired by your 30 days of kitchen organization and now have some paint left over after painting the pantry, this would be great for storing the leftover paint. These are awesome!!! We just built our home and I absolutely do not like storing our paint colors in the cans they came in, this is a great idea! This would be great I’m always touching up paint with kids around. 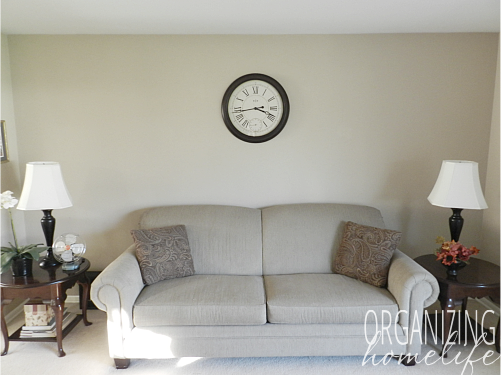 I need to touch up the paint in our family room where basketballs seem to hit the wall (sigh!) Love that I could do this without opening up a whole gallon of paint and doing all the cleanup afterwards! Great idea! I lots of scuff marks that need covering! These are more sturdy and well made than what I’ve seen on the market. And the ability to stack them is an added bonus. I NEED them. I just cleaned up all my painting supplies and still have a lot of big paint cans and a small space. These will work so well. Thanks for the opportunity to win them. I love how convenient these are! I have several places to touch up! Genius product-wish I’d invented them! I’ve already ordered 10 through Dipsy Dabber website but I need at least 6 more so I have my fingers crossed that I win!!!!! What a great Idea!!!!! Cant wait to use these this will help me contain the paint can mess. Love the way they Stack. Thank you for bringing these to our attention. I have been using glass mason jars to store the leftover paints. I think these will work much better and are not breakable! Very clever product! I would love to be rid of the mess of paint cans in my basement! What a fantastic idea! So clever and I love that there is no brush to wash. Wish I had thought of these! I could definitely use these on more than one wall in my house! I love the all in one packaging! We just painted the living room and kitchen this past summer, these would be great for the little touch ups. Love the all in one packaging. We painted a few rooms this summer and this would be great for the little touch ups. I have tried different paint storage solutions but these look great! Hope I win some! I would like to reduce my huge pile of paint cans! What an awesome idea! I HATE doing touch ups–this makes things soooo simple! Thanks for sharing! Why didn’t we think of this? Great idea! What a clever idea! I have several gallons of paint with only a dab left in them, but I do not want to toss. This genius idea will certainly help with that task! Easy to stack and store and easy access to take care of those chips and scuffs! Thanks for the opportunity to win! Awesome product! I wish someone had come up with this years ago! Genius idea! I’ve been looking for a touch-up paint solution like this for a long time! what a great idea! Hate hate hate saving all the big paint cans…. and when you open them, they’ll useless. This could save time and money…. and the stacking feature is great. AWESOME product!! Why didn’t I think of this?!!?! No more shaking of the huge paint can and getting a brush dirty. And like you, I like color but putting holes in the wall and then having to touch them up if I ever change anything keeps me from putting things on my walls!! This would be a great boost in the direction of hanging things!!! These are absolutely genius. What a giant space saver. Oh holy moly what a fantastic idea! I love that they can stack and would be so easy to store and use! I have little touch-ups to do in just about every room of my house right now. Why is that, since I just painted?! Ugh. Love how they stack and have a place for a color swatch! I’m getting ready to repaint the interior of my home, almost all the rooms, so I would use them to have a ready supply to touch up when I need to after all the hard work is done! These little guys look wonderful! I have several spots that need touching up that have remained because of the hassle of getting everything out. Would love to have some of these containers! Wonderful! Just what I need to save the paint for touch ups to my bath. I plan to paint the bath, because I have changed and moved my towel rack and didn’t have any paint saved to touch up where the holes were spackled. In the future, I won’t have to worry about that, as I will be saving some of the new paints in Dipsy Dabber, for sure! That is the most amazing thing I’ve ever seen!! This is such a great idea! Those paint cans take up so much room. I have two holes above my fireplace that have needed to be touched up for months – from pictures I removed. The thought of lugging out the paint cans and dealing with the hassle of finding a paint brush, stirring the paint, etc has kept me from touching up the paint. I would love to get my paint organized with these! These would be so perfect! I have small, glass jars of touch-up paint for our different colored rooms and these would make it so much easier. First touch-up? Probably the ceiling where the step-ladder left scuff marks (oops!). This would make my painting a whole lot easier!!!! I love everything that you listed! SO smart to begin with and then to make sure that they stack and all that… genius! I like that theyre small and handy to store in the kitchen on a shelf. And stackable! Sounds like a great product. I love everything about this product! The size, the recessed area on the bottom for easy stacking, the built in brush with rubber valve…everything! I’d touch up the wall corners in our entire house first. We moved into our newly constructed home 3+ years ago and I have yet to touch up the corners damaged in the move. Opening a 5 gallon can of paint for touchups has been low priority. With this product I could touch up the entire house in minutes! Thanks for the giveaway opportunity! I need several of these! How smart! I need this product! The first things I would touch up are the black cabinets in my kitchen and the place the kids peeled off the wall in the dining room. Pure genius. I already ordered three. I have a few spots in the bedroom that need touching up! Such a smart idea. I am forever having “touch up walls” on my to do list with 2 boys in the house. Does it get done? No! Definitely on my to purchase list! Thanks for the heads up! I love everything about this unique product! The sheer convenience alone of storing them makes it a double hitter! the first thing I would do is touch up a few spots on the door casings in my den. Awesome product! This is just what I needed for moving right now, touching up paint all over the place!! Thanks for the info on this!! I LOVE that I will have no problems using this. My husband and I (after the last time I tried taking the lid off the pain can) decided I was not allowed to do anything with the paint in the house…I agree…but this I could do! Oh, no, Stevie! That sounds like a story!! Not too much of one…I’m just a klutz and dumped it all over myself. This will definitely be the gift for someone I know! So cool! I totally need these as I have several paint cans with just a wee bit of paint in them. I have plenty of walls I need to touch up, but I have no desire to haul out the large cans, mix the paint, dirty a brush, etc. This looks like the perfect solution. I love that they’re stackable! I love this size and I would touch up nail holes in my living room. Such a cool idea. Would love to win! Love it!! We are getting started on some paint projects in our house and these would be a great way to store some extra paint without the hassle of the entire paint can! I love this! I actually spent the day painting my son’s room today and thought about what kind of container I could put the small amount left over instead of keeping it in the gallon size can. I love that it st small, compact and has a built in brush. I would use the first one for the paint that I have in my great room. With 4 boys, husband and a dog, there are always spots to touch up. I will use it first to touch up around the Nest thermostat that our son gave us. Then I can get rid of the ugly plate behind it! Stocking Stuffer for myself! This sounds great. We are going to be doing a lot of painting in our new home in the near future. It’d be great to have some of these around. Please pick me. I am so excited about this. The Dipsy Dabber is the perfect solution for touchups. I will be touching up my hallway! Genius! So hoping these will be available locally, and soon! This look like something worth trying. Much cleaner and easier way to store that extra paint. I like how small it is and convenient to use. I’d touch up some spots in my living room. What a great idea! I need to try these. Wonderful product! I’m moving to a new house and will have lots of paint cans with not much paint left and lots of scratches and scuffs to touch-up after the movers come. 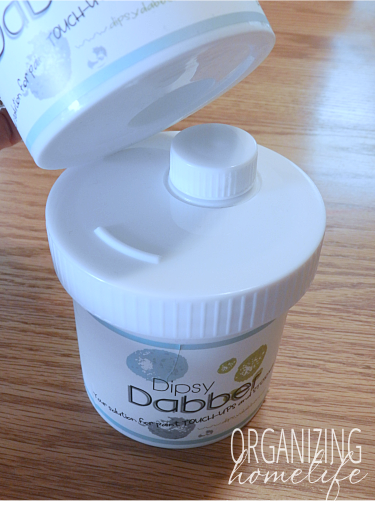 I would love the Dipsy Dabber because it would make it easier for me to store and use paint for touch ups. I usually just throw away the old paint if there is only a little bit just to avoid having to store the big and bulky cans, but with this product I wouldn’t have to get rid of them and have to try and figure out the color at the paint store for minor touch ups! My first touch up project would be in my bedroom. I am planning to redesign and decorate my room, but I have a huge canvas with big marks in my wall that need to be touched up. These look perfect! My house is riddled with little paint imperfections from the kids. Can’t wait to own my own and have a retouching party for myself around the house. Great idea! I would love to have one of these. What an awesome idea! I would to pour all my cans, I have a lot of them, into these cute containers. I have 9 grandkids & 2 dogs so scuffs, chips & bangs happen on almost a daily basis. This is genius!!! I have a rental house and 4 kids! I’m touchin up their messes weekly! Thins us brilliant!!! I have so many cans just taking up space in the garage & I’m totally an organizing freak!!! This is a beautiful creation!! These would make my life so much easier! Now this would initiate some much needed tlc to my kiddie-scuffed walls! They would be wonderful for small jobs and when the kids are painting. I could really use them. This is brilliant! My sister and I just started refurbishing furniture. We have so much paint!! How convenient!!!! Much needed in my workshop! That is awesome! That would be way better than the 20 cans of paint we have, not to mention not having the hassle of having to do a touch up! I love how convenient this product is!! I hope I win this because I need to touch up my kitchen! Hey Ginny, the Dipsy Dabber is such a great organizational tool! I have always put my small amounts of extra paint into old plastic food bowls, but have worried about them not being airtight and then drying out. I sure wish I’d thought of this idea…it is HUGE! You have been inspiring me for a long time with your organizing ideas, and the use of this item is no surprise at all for me, coming from you! I love that it looks so easy to open. Being aversive to pulling out various tools from the garage to open one of those annoying paint cans I like that it can be stored in the same room and opened quickly. I have a cranberry wall that needs a few white marks covered over. Would love to start filling them up so I can stay on top of the kids’ marks. Oh my word this is fabulous and so affordable!!! Thank you for sharing this great looking product! This is such an amazing idea!!! My whole living room needs painting. Would love to store the leftovers in these cute little containers so when my 3 small kiddos leave their mark it is quick and easy to touch up. I love how they are such a space savor! Would love to get some space back in my laundry room. First room to touch up will be my Kitchen. Portable, stackable, affordable…what’s not to love! 🙂 I will use them to organize my leftover paint colors. I love it. Finally I can get rid of the gallon cans that just clutter up the garage and doesn’t keep the paint fresh. My living room needs the touch ups! I love this handy little gem!! Just found them and I’m so glad!!! We just bought a house and this would be so much better than using baby food jars!! Love it! This is so cool!! Thank you for teaching me about these, I bought a house this year and have been trying to find a good way to store the leftovers and this is PERFECT!!! How wonderful! I could use dozens of these! Great idea!!! I would LOVE some of these!!! 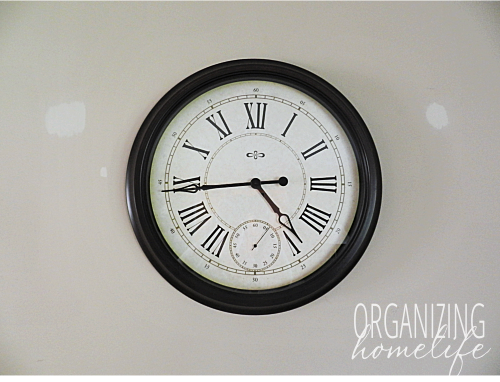 So many areas in our house need touching up and I’d love to be able to get it done quickly. Love the convenience of this and not having to drag out the big paint cans! I’ll be touching up nail holes all over our house! Ooh…I LOVE this!!! I NEED this!!! I have several spots that need to be touched-up, but the thought of bringing in the cans and rinsing out several brushes, well…that’s why those spots still need fixing. I love this whole idea! So handy and I love the place to mark which room! I love that the brush can be stored inside the paint container and the containers can stack easily. The first thing I will touch up will be my front entrance hallway. I love the whole idea of it…..and it takes up less space the keeping the big paint cans!!! These sound great. I’d love to try some and then give them as gifts. These are the coolest things! I would use it to touch up the Disney paint in my office!! Stackable. I’ll use them to touch up living room walls. We just bought our first house—it’s a fixer upper. Army green and pale yellow have got to go. Make way for blues and Greys—I want this house to look totally different when I’m through with it. And that includes organizing! Thank you all for the nice comments! Thanks Ginny for the great blog post with great details and photos! We love this product and are super excited about all the great comments and orders we are getting! Dudley dabbled is such a smart idea. I would love it. What a wonderful idea. So many paint cans!